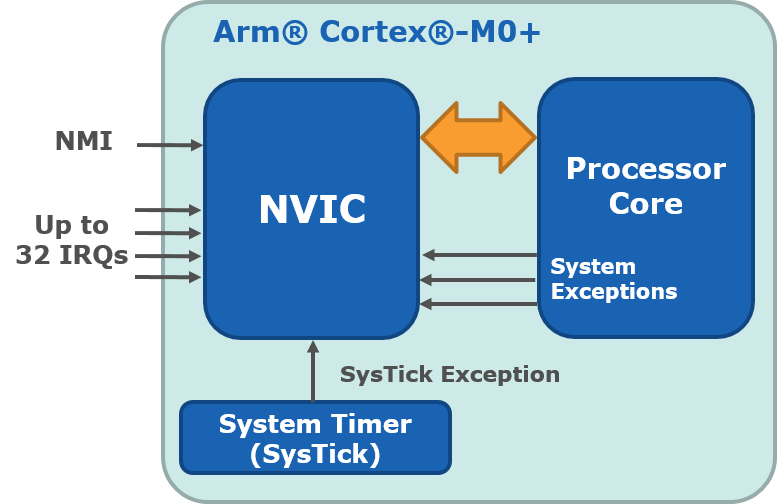 On ARM® Cortex®-M0+ Processor Core MCUs, such as the SAM D21 family, peripheral/external interrupts, traps, system calls, and everything else that can disrupt the normal flow of execution are called exceptions and are handled by the Nested Vectored Interrupt Controller (NVIC) in the Cortex-M0+ processor core. This page provides an overview of the Cortex M0+ exception model, as well as the basic NVIC functionality. The NVIC is an example of an interrupt controller with extremely flexible interrupt priority management. It enables programmable priority levels, automatic nested interrupt support, along with support for multiple interrupt masking, while still being very easy to use by the programmer. The NVIC design supports up to 32 external (to the core) interrupt request inputs (IRQs) plus a number of built-in system exceptions. For each IRQ input, there are four programmable priority levels. 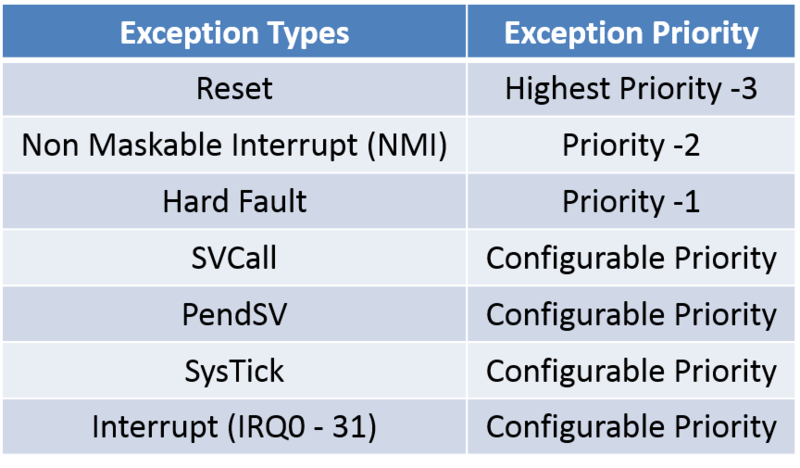 In addition to the external interrupt requests, the NVIC design supports internal exceptions, for example, an exception input from a 24-bit timer called SysTick, which is often used by an OS. There are also additional system exceptions to support OS operations and a Non-Maskable Interrupt (NMI) input. The NMI and HardFault (one of the system exceptions) have fixed priority levels. A peripheral generates an interrupt request (IRQ) to the processor. The processor hardware detects and accepts the IRQ. The current executing task is suspended and registers R0-R3, R12, R14, the return address PC, and the PSR are pushed into the stack to save the execution context. The processor locates the starting address of the interrupt handler from the vector table and executes the handler associated with this IRQ. The processor finishes the handler execution, restores the context (register values) previously pushed to the stack and resumes the interrupted task. The interrupt handling is vectored, which means that the hardware automatically determines which interrupt or exception routine to execute. The Vector Table is a lookup table in memory that provides such information. By default, the table begins at address 0x00000000 in the SAM D21 Flash program memory. When the processor is turned on or reset, the processor fetches two words located at the first two locations in the Vector Table, 0x00000000 and 0x00000004. The processor uses the word at 0x00000000 to initialize the Main Stack Pointer register (MSP), and the other one at 0x00000004 to set up the Program Counter PC to point to the start address of the Reset Handler procedure, as determined by the compiler and linker script. After the PC is initialized, the program begins execution. Each entry in the table is the starting address of an exception handler with the LSB set to '1' to indicate that the exception handler is in Thumb® mode. Reset is invoked on power-up or through a user reset. The exception model treats reset as a special form of exception. When a reset is asserted, the operation of the processor stops, potentially at any point in an instruction. When a reset is deasserted, execution restarts from the address provided by the reset entry in the vector table. Execution restarts as a privileged execution in Thread mode. In the SAM D21, the reset signals (user reset, power reset) are generated by the Power Manager (PM) peripheral. The NMI is similar to the IRQ signal, but it cannot be disabled and has the highest priority apart from reset. In the SAM D21, the NMI signal is generated by the External Interrupt Controller (EIC) peripheral. Cortex-M0+ does not include a divide instruction, so there will be no hardware exception for that. The behavior will be defined by your compiler; for C and C++ it is an "undefined" behavior and will be flagged as a warning upon compilation. SVCall exception takes place when the SVC instruction is executed. SVC is used in OS-based applications, allowing applications to access system resources. PendSV is another exception for OS-based applications. Unlike the SVCall exception, PendSV can be delayed, and allows an OS to schedule system operations only when high priority tasks are completed. If the device implements the SysTick Timer, a SysTick exception is generated when the SysTick timer reaches zero. In the SAM D21 Cortex-M0+ Core, the SysTick Timer is implemented. An external-to-the-core interrupt (or IRQ) is an exception signaled by a peripheral, or generated by a software request. All interrupts are asynchronous to instruction execution. 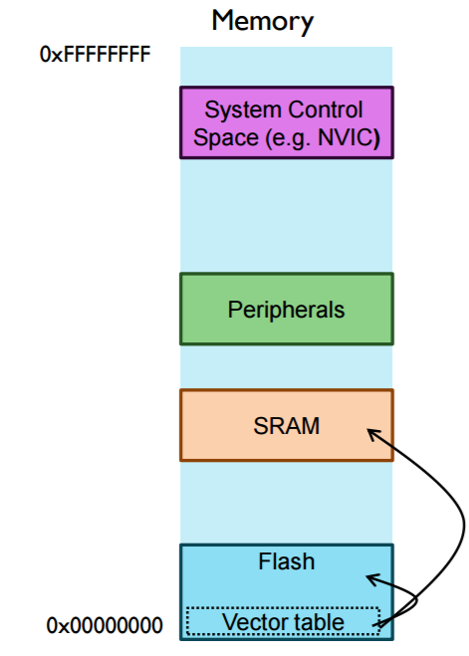 In the system, peripherals use interrupts to communicate with the processor. 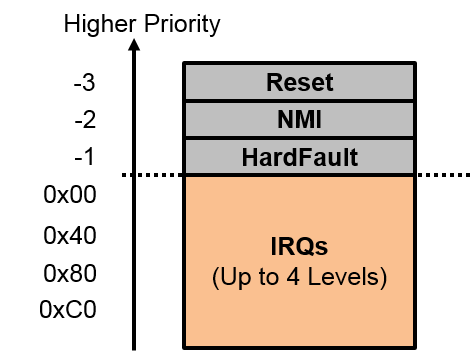 For each IRQ input, there are four programmable priority levels. On SAM D21, the core implements 28 IRQs, which are generated by on-chip peripherals (SERCOM, ADC, etc.) as well as the External Interrupt Controller (EIC). Priority determines the order of interrupts to be serviced. Each kind of exception has its own exception priority value; numerically lower numbers correspond to higher urgency. Priority values can be fixed or programmable. Out of reset, all interrupts and exceptions with configurable priority have the same default priority of 0x00. This priority number represents the highest-possible interrupt urgency. If two exceptions happen at the same time and they have the same programmed priority level, the exception with the lower CMSIS IRQ number will be processed first. Where priority values (0, 1, 2, 3) correspond to interrupt priority register (IPRx) settings 0x00, 0x40, 0x80, 0xC0. So, we see that a higher priority parameter corresponds to a lower programmed interrupt urgency (priority). Often in real-time embedded programming, it is necessary to perform certain operations atomically to prevent data corruption. The simplest way to achieve the atomicity is to briefly disable and re-enable interrupts. The PRIMASK CPU-core register prevents activation of all exceptions with configurable priority. The interrupt latency on the Cortex-M0+ is deterministic and doesn’t have any hidden software overhead, which can be observed in many other architectures. Entry latency determines how quickly we can act on any particular input event. Once an interrupt occurs, the NVIC hardware automatically stacks an exception frame (registers xPSR, PC, LR, r12 and r3-r0) onto the Process Stack (PSP) and branches to the interrupt handler routine in Handler Mode (which uses the Main Stack). Entry Latency on Cortex-M0+ is 15 cycles. The exit latency is 13 cycles. The interrupt exit latency is two cycles fewer than the interrupt entry latency, as the processor can recognize in advance when the handler is terminating and doesn't need to synchronize an external signal. Apart from that, it has to complete the same operations but in reverse. When the processor is executing an exception handler, an exception can preempt the exception handler if its priority is higher than the priority of the exception being handled. When one exception preempts another, the exceptions are called "nested exceptions". The Cortex-M0+ incorporates a feature for switching from the end of one interrupt straight to the start of another. This is called tail-chaining. Because the context is already saved on the stack from the first interrupt, there is no need to go through the entire save/restore context procedure between the end of one interrupt and the start of the next. The processor simply switches from one to the other. Rather than 28 cycles (15 + 13), this takes only six. This mechanism speeds up preemption. If a higher priority exception occurs during state saving for a previous exception, the processor switches to handle the higher priority exception and initiates the vector fetch for that exception. State saving is not affected by late arrival because the state saved would be the same for both exceptions. On return from the exception handler of the late-arriving exception, the normal tail-chaining rules apply. 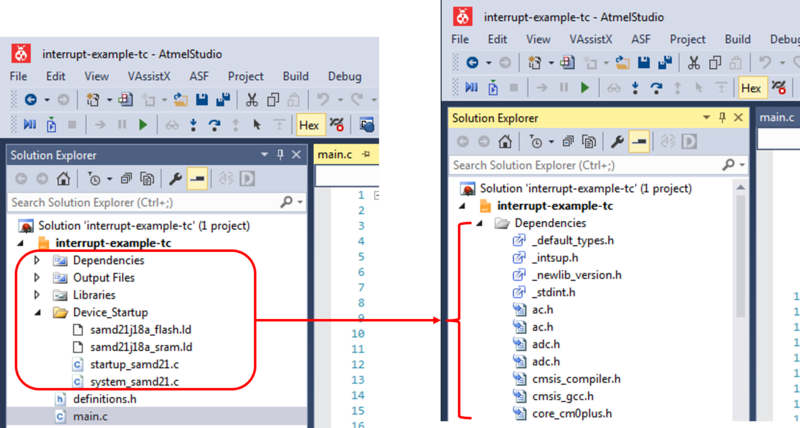 Upon performing a 'Rebuild-Solution' action on a GCC C Executable type project in Atmel Studio, several source code files are added to the project to support interrupt-driven applications. Source file startup_samd21.c contains a declaration of the Vector Table. Linker script samd21j18a_flash.ld maps the Vector Table to address 0x00000000 in Flash program memory. 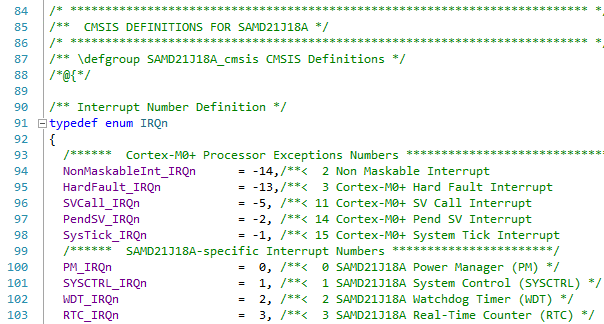 Device header file samd21j18a.h contains the peripheral-interrupt-to-CMSIS-IRQ-number mapping. Default exception handler functions are defined in startup_samd21.c. They're defined as “weak” functions, so you can override the default implementation with your own.